Details of Prize Giving will follow shortly. 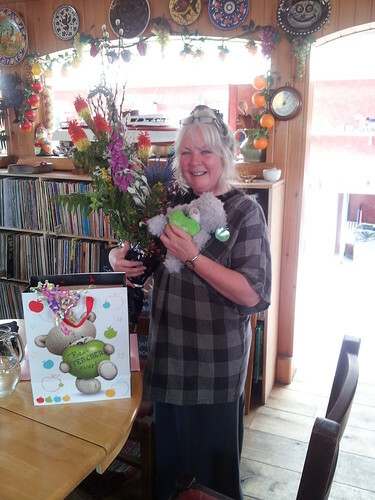 Staff Retiral – Staff and pupils bid a fond farewell to Ms Pat Gulliver. She will be greatly missed. Throughout the week there have been several events to show our appreciation of her service to the pupils and the school over the years. Pat is held in high regard and greatly respected by everyone who knows her. We hope that she will not relinquish her ties to the school completely and that she enjoys a long and healthy retirement. French Trip – At 6:30pm on 1st of June, 41 pupils in S2/S3 and 5 teachers left for France. The journey was long but after 24 hours travelling we arrived at the Château du Molay in Normandy, France. We had almost a week of activities but we had some favourites. For example, on the Sunday we travelled to a market near where we were staying. It was amazing but it was very crowded. We then went to a museum about the Second World War including the D-day landings. The museum was really interesting and we learned a lot from it. The following days were just as memorable. Everywhere we looked there was something different. On Thursday 6th of June we went to everyone’s favourite, Parc Asterix. The weather had improved so we were able to enjoy all the rides, water ones and dry ones. The teachers loved it too. The park was really well designed and made you feel as if you were in a movie. The best ride was based on the movie “Mission Cleopatra”. We would recommend going to it. Our Archaeological Dig! 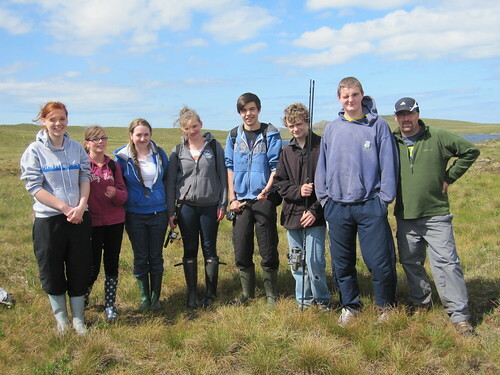 – On Tuesday 19th June the S2 pupils of Gairloch High School carried out a series of activities to do with the archaeological excavating of the Roundhouses in Achtercairn. They did map reading, GPS navigation, collecting soil samples (and later testing them), compass readings, measuring the roundhouses, learning about their age from differences in the colour of the vegetation and what they would have looked like. They even got to do some excavating of their own – probably the most popular activity! Later in the afternoon they made posters in groups explaining the morning’s work – proving conclusively that they learned a lot! Despite the midges, S2 had a really good time at the Roundhouses. Visit the website by clicking here and find out more. Perfect Attendance – Charlie Bulmer and Natasha Fraser were presented with certificates for maintaining perfect attendance throughout the session at the Prize Giving this week. Return of Textbooks – In times of rising costs and strict budgets, we need to make the best use of the resources we have, so if you come across any stray High School textbooks over the summer, please return them to school. They can be handed in to the school office, or to the Library during normal holiday opening hours. In-Service Training Days – Parents please be aware that the Council have added two extra training days following the Summer break and the October holidays for teachers. Pupils start on Wednesday 15th August and Wednesday 24th October. These dates as well as others can be found on the school website. Enjoy a good summer! Prize-Giving – Our annual Prize-Giving Ceremony will take place on the afternoon of Wednesday 27th June between 1.30pm and 3.30pm in the school at which we will celebrate the success of all the pupils in the school and highlight some of the special achievements of the year. Parents and friends of the school are invited to join us. 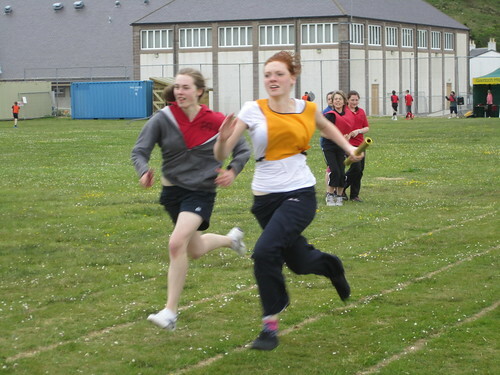 Activity Week – S4 pupils took part in an activity week from 28th May to 1st June. For the first three days they worked in teams under the watchful eye of Mr Hulme, Mrs Whall & Mrs Hildrey. Their task was to design and produce a prototype and deliver a presentation to the school about their game or toy. Ms Gulliver and Ms Hunter used CrazyTalk software with the S4s, who all presented a picture of grumpy old men and women complaining about the teenagers of today! Presentations were made in front of the rest of the school after a question and answer session. The winning team with their project entitled – “Walk on Walls” were: Danni Bulmer, James Conniff, Luke Gorman, Donnie MacLennan and Laura Ridehalgh. For the rest of the week pupils chose from a wide variety of activities which they could take for a whole day, or a morning or afternoon. 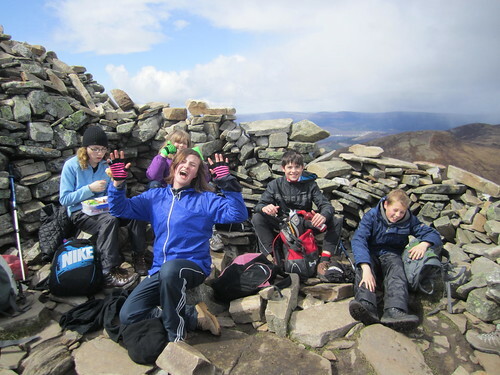 These activities included: mountain biking; refreshing the Home Economics department; expressive arts; fishing; wool spinning; debating; rock climbing; discussing social networks; computing and sea kayaking. Pictures of these activities can be seen on the school website by clicking on the photo of our anglers below. All in all, an excellent week – a big thank you to Mr Sutherland for his organisation and to all staff who supported this great week and to the pupils for their ‘can do’ attitude! School Captains – For Session 2012-2013 Ian Paul and Sarah Mackenzie have been awarded School Captain status. Vice Captains are David Robertson and Rachel Mackenzie. Senior pupils were welcomed back on Tuesday at Assembly and have been working through their option choices for the coming year. Mentoring – Before Study leave commenced all S5 pupils moving into S6 in August were invited to submit an application, outlining their qualities and wishing to be considered for a mentoring role to the new S1 pupils. Eight pupils applied by the deadline set and all went through training with Mr Milner and Mairi Beeson, our Children’s Services Worker. Each Mentor will have 3 or 4 mentees and the role of mentor will be a significant one throughout the year. Mr Milner is hoping that the role of becoming a mentor, with a badge of office, is something the younger members of the school will aspire to. As part of their induction, all P7 pupils have met with their mentor. Primary 7 Pupils – P7 pupils visited the High School last week for two full days. They have had the opportunity of following a more typical timetable and therefore getting used to moving from class to class and meeting various members of staff, visiting the Den, meeting Susan Maclean and Fiona Downie, Youth Development officer. At the end of the second day they were presented with their ties by Acting Headteacher, Mr Hulme. 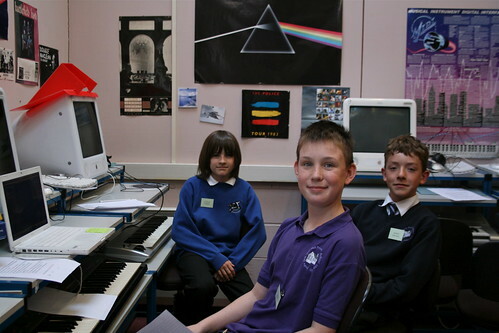 P7 Expressive Arts Day – This took a different turn this year from usual, due to the fact that we obtained a new piece of software called “CrazyTalk”. 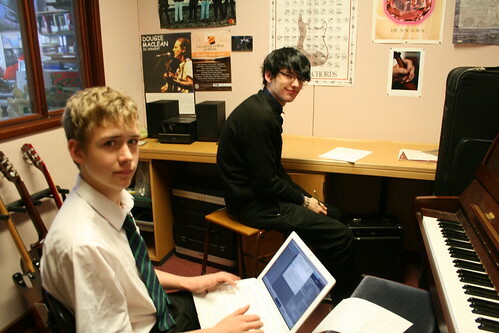 This allowed pupils to create self-portraits in the Art Department and to record a short biography of themselves in the Music Department. These 2 activities are brought together by the software to create an animated image of each pupil, appearing to speak their prepared biographies. While Ms Gulliver and Ms Hunter struggled with the technology, Mrs Hildrey took the P.7s outside in the glorious sunshine for an afternoon of sport. During the first Induction Day, the P7 pupils were able to see the fruits of their labours, and the resulting movie was appreciated by all. Click on the photo to see some more of our P7 guests. Comenius Concert – On Wednesday 30th May, pupils took part in a concert in the school hall, celebrating the excellent work they have achieved in their musical work throughout the year. 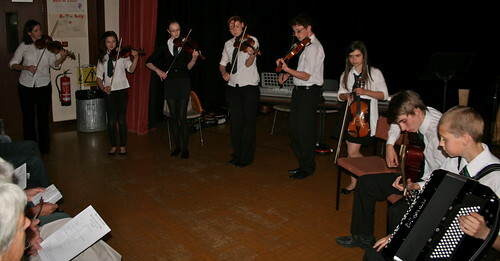 The new “version” of C for Craic brought many of the pupils together in wonderful group performances. We were well entertained by performances from: Megan Copland, Ceitidh Alice Hulme, Alasdair MacDonald, Christie Wilson, Becky Griggs, Ainslie MacKenzie, Oscar Howard, Luke Gorman, Beth Townsend and Freya Baptist. In addition, 3 younger pupils – Connor Forbes, Iain Nelson and Catherine MacRae – braved the spotlight for the first time, and played together with much confidence and talent. Well done to all! A big thank you goes to Ms Rhona Sutherland for her work with all the string players, and with her direction of C for Craic. Donations totalling £143.12 went to the Comenius Project Fund. Many thanks to all the members of the community who came along in support of our pupils. Click on the photo to see more photos of the evening. Malawi – As you read this, Mr Hulme and Mrs Johnston will hopefully be in Malawi to visit our partner school, Mlozi LEA School. While there, they will continue the work on the joint projects, to work with learners and teachers in class and to teach some more Scottish Country dances. Time will be made to use the bicycles bought on Mr Hulme’s last visit to explore the area, subject to the bikes continuing to work. Another intention is to bring back more images of the country to share with pupils so as to further develop their awareness of their culture and way of life. They look forward to meeting again those in the school who have visited Gairloch in the past. In contrast to Mr Hulme’s other visits, this will be their winter though this much like our summer weather just now. More in the new school session. We wish them an enjoyable and successful visit. Archaeological Dig – All S2 pupils will have an exciting opportunity to take part in the archaeological excavation of one of the roundhouses at Achtercairn on Tuesday 19th June. They will be out at the dig site all morning and if they are to be able to gain the most from this experience it is important that they come suitably prepared. A letter with information for parents and details of what pupils will need for that day has been sent home with pupils. Retiral Ms Gulliver – This is a little reminder to the community about Pat Gulliver’s retirement. There is going to be an afternoon tea in the school on Thursday 28th of June at 2p.m., to which all members of the community, and Pat’s ex-pupils are invited. We would appreciate, however, if you could contact the school office if you intend to come; this is purely to ensure that there’s enough food! If anyone would like to contribute to Pat’s retiral gift, this can also be done at the school office. Junior Maths Challenge – S1 and S2 recently took part in the annual Junior Maths Challenge. Alfie Gudgeon got best in school and received a gold award for the second year in a row. Also achieving a gold award was Jordan Gorman with Freya Baptist achieving silver. Mark McLean also achieved silver and he was the best in S1. Rosie MacKenzie and Louie O’Brien managed to get a bronze. Well done to all of them and everyone who took part. S3BronzeDofE – Having successfully completed their training walk and camp at Slattadale on Fri 11th May (midges did appear despite the cold!) and the First Aid training in school last week, final preparations are now underway for practice expeditions on Mon 28th – Tues 29th May. Click on the photo above to see more images of the pupils training. Gold DofE – A group of seven current and former pupils Anna Hulme, Callum Vickerstaff, Calum Milner, Jake Bulmer, Kirsty Alexander, Gemma Urquhart and David Robertson are going to Glen Affric next week for their Gold Duke of Edinburgh practice expedition, accompanied by Mrs Johnston and Mrs Bulmer. Their aim is to make a video/photographic presentation to encourage other pupils to do their Gold expedition. 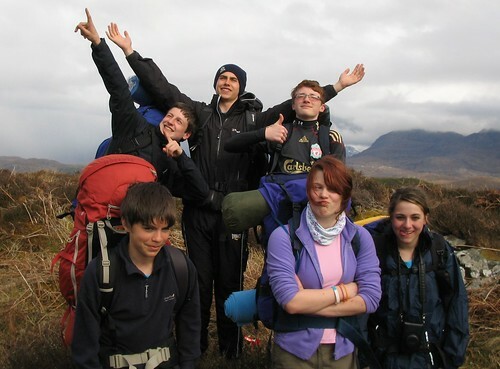 Weather and fitness permitting, they will be climbing hills in the area from a base camp near Alltbeithe Youth Hostel. Detailed report to follow! S2/S3 Biology – The S2 and S3 biologists were involved in a workshop on the ethics of using stem cells last week. (Stem cells are cells that could potentially be used to repair failing parts of the body, for example in heart disease, diabetes or Parkinson’s. The source of stem cells is often embryos that are left over from IVF treatment). Scotland punches well above its weight in stem cell research. The presenters were Henriette Laidlaw from the Scottish Stem Cell Network and Dr Bill Ritchie, from the Roslin Institute. Dr Ritchie was part of the team that created Dolly the sheep. It was a privilege to host someone so eminent. As was intended, the workshop raised more questions than it answered! Culture Club – This week Culture Club attended an event in Eden Court that was at the other end of the dance spectrum from Scottish Ballet! It was called ‘Breakin’ Convention’ and was a Festival of Hip Hop Dancing, organised under the name of Sadler’s Wells. The evening started with a talk about the history of Break Dancing by Jonzi D, the Artistic Director. We heard about the roots of Hip Hop in the ghettos of New York and Los Angeles during the rise of the Civil Rights Movement and after the assassinations of Martin Luther King and Malcolm X and the development of, not only Hip Hop, but the related arts of Rap, Beat Boxing, DJing and Graffiti. The show itself was impressive, starting with a selection of groups, several from Scotland, who showed their skills, and culminating in a stunning extended performance by the world record holding French line-up called The Vagabond Crew. Not only did they excel at spinning on their shoulders and their heads, popping and blocking with great style, but they did so within an effective theatrical theme. Culture Club is hoping to make one more trip before the end of the session but haven’t yet earmarked our final event. Primary 7 pupils – P7 pupils visited the High School last week for two full days. We look forward to their return in June for two more days when they will follow a fairly normal timetable. Dogs on the pitches – Dog mess has been found on the grass pitch recently. We would ask that all dog owners act responsibly and keep away from the school grounds all together with their animals.